Microsoft regularly makes available critical Windows XP and Windows 2000 security patches (or hotfixes as they are also called) which ensure that your operating system keeps up to date. These patches/hotfixes are obtained in a variety of ways such as visiting the Windows Update or Microsoft Update website (accessible from your START button). Other ways are through the Automatic Update service which runs in the background on your PC and runs daily or weekly checks for recently issued updates/patches/hotfixes, or by System Administrators downloading and applying patches and hotfixes to your PC. Regardless of how the hotfix is obtained, there is one thing you should be aware of. All of the files that will be replaced by hotfixes are backed up on your hard drive just in case the update goes bad and you need to return your PC to its prior state and uninstall the patch. 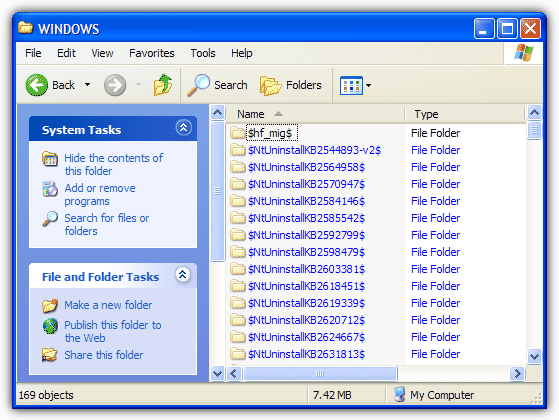 These older files that are replaced are stored in hidden folders in your Windows system folder. Over time these backup folders accumulate and can occupy a significant amount of disk space. For example, using a tool to find out what’s using your hard drive space, will probably show that a Windows XP PC with service pack 3 and all the latest hotfixes installed will have created thousands of files and easily takes up 600+ Megabytes of hard disk space. Are these backed up files useful to retain, or can they be deleted and disk space freed up? 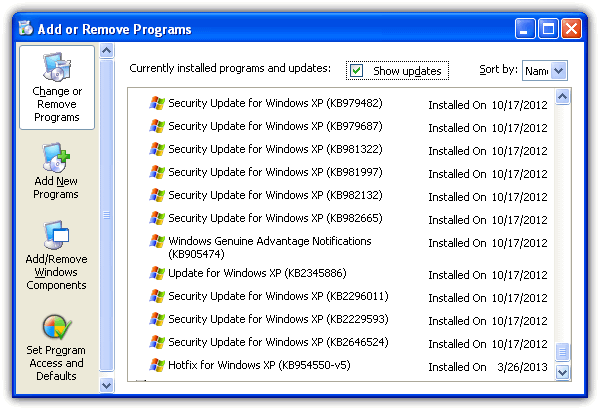 Ever since I started using Windows XP, I’ve never had any major problems after installing Windows Update hotfixes. Instead of immediately cleaning up the old backed up files, it’d be better to monitor your PC for a few days to see if everything is working properly, and that nothing “broke” during the update. Sometimes an update can go awry for a multitude of reasons, and if so, you can uninstall the recent hotfix through “Settings -> Control Panel” where you will find an Add/Remove Programs applet. All of the updates will be listed there by date. In Add/Remove make sure the “Show updates” checkbox at the top has a tick to make the updates visible. However, if a number of days and weeks pass and your computer is running fine, then there should be no more need to keep those backed up old files on your hard drive. But since these files are stored in hidden folders, it may not be obvious to the average user how to delete the folders and their accompanying files. Here are 5 tools and a manual method that you can use to easily delete backup files that were created when installing a Windows hotfix or service pack update. 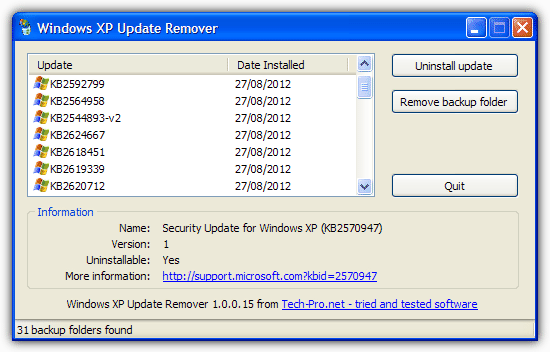 Windows XP Update Remover is a freeware tool that lets you easily remove the $NtUninstall backup folders and associated uninstall information from your computer to save disk space. It can also be used to uninstall Windows updates. Removing the backup folders makes it impossible to uninstall the Windows updates so you need to be sure there are no problems first. However, it’s unusual to have to uninstall an update unless it causes problems, and that will usually become apparent soon after receiving the update. So you can safely remove the backup folders for updates that are more than a few weeks old, and recover the lost disk space which could run into hundreds of Megabytes. Everybody’s favorite junk and privacy cleaning tool CCleaner has as option already built in to remove hotfixes from Windows XP. 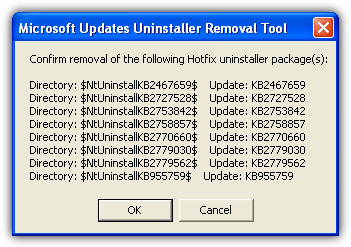 All you have to do is enable the checkbox “Hotfix Uninstallers” in the Advanced section on the Windows tab. Then click the Analyze to see how much space you can save first or just click Run Cleaner. This remover is not as advanced as the other tools because it’s a simple on/off option that will either remove all updates, or remove no updates. But if you’re sure you want to delete all update backups, it doesn’t come much easier than this. This is small Visual Basic script we came across when searching the internet and it performs the simple task of looking for the hotfix backups, and deleting them if confirmed. All you have to do is run the tool and it will pop up a list of what hotfix uninstall packages can be deleted, click OK to continue and remove or Cancel. Confirming the removal will delete all the $NtUninstallKBxxxxxxx$ folders, the matching log files in the Windows folder and also the entry from Add/Remove Programs in Control Panel. The script was originally in French but we’ve translated it to English. Dear Raymond, Thank you SO much for this great article and the tools to get rid of those unwanted files. Gosh, every time I turn off my computer, it starts trying to update itself, but there are some old update files that are apparently no longer supported by Windows, and they can hang my computer up all night long and prevent it from shutting down because it keeps trying to get beyond those files. I was in utter despair about this, not knowing what to do to resolve it, so at least now I have something I hope will help take care of this. I am always having to shut down my system by just pressing the off button, and I know that causes more problems. I do check and try to clean up the registry and do have programs to do that, but overall, those old unsupported files were still there. Thank you very kindly for helping all of us who have these problems. Cleanup seems to work fine on my Win2K. thanks you for your information…. Thanks very much for this – I deleted 270 old update file backups and gained nearly 1 Gb. Removed almost 300 “update folders” and gained just about 100MB, what a waste! Thanks Ray. I love your blog and all the things that you offer.